There are a record number of women running for public office in 2018, and this includes women lawyers. 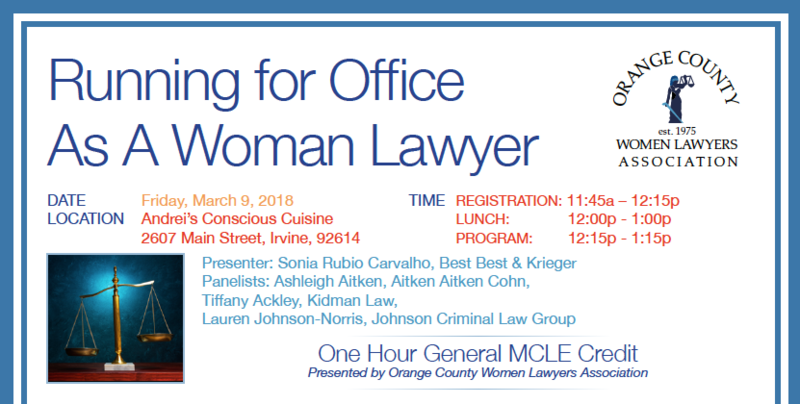 Come join the OCWLA for an engaging luncheon where we will learn from city attorney and municipal lawyer Sonia Rubio Carvalho about the business, legal, ethical, and other rules for attorneys running for public office. The presentation will also include a panel of women lawyers who are first-time candidates for public office, including former OCWLA President Ashleigh Aitken (running in Anaheim), Tiffany Ackley (running in Aliso Viejo), and Lauren Johnson-Norris (running in Irvine). The presentation includes a catered lunch.